Tax display will allow you to modify how you wish to display tax on the proposal acceptance, engagement letter & web connector as well as customize your tax label display. Tip: The Sales Tax Label can be customized however you wish. If you have flat tax rates, you can include the tax rate on the label to make it visible to your clients e.g. instead of using GST, use 10% GST. When a default company tax rate is set, services will default to this rate but this of course can be overridden at a service and proposal level. The company default tax rate will be highlighted in the list. Australia and New Zealand have flat rate sales tax which means for the most part, the services they are offering have a fixed sales tax applied regardless of who they are selling to. In this situation, unless you have a specific requirement to specify a tax rate that different from your default i.e. a service that you offer is tax exempt, then it's not critical to upgrade your existing proposals. Countries such as the United States, United Kingdom, Canada and parts of Europe have more complex tax requirements. Tax rates can differ from service to service and can differ based on who you are providing the services to. In this situation it is recommended to review and upgrade each proposal individually. Upgrading the proposals will mean that future invoices will be sent to your invoicing system correctly and editing invoices to set tax rates will no longer be necessary. Please see the section below and follow the steps to upgrade your existing proposals. At a service level you can provide tax rate overrides. Most customers can just keep this defaulted but if there is a particular service that you would like to default to a certain rate when you a building a proposal you can set it here. Click into the Services tab, then click the service you want to edit. 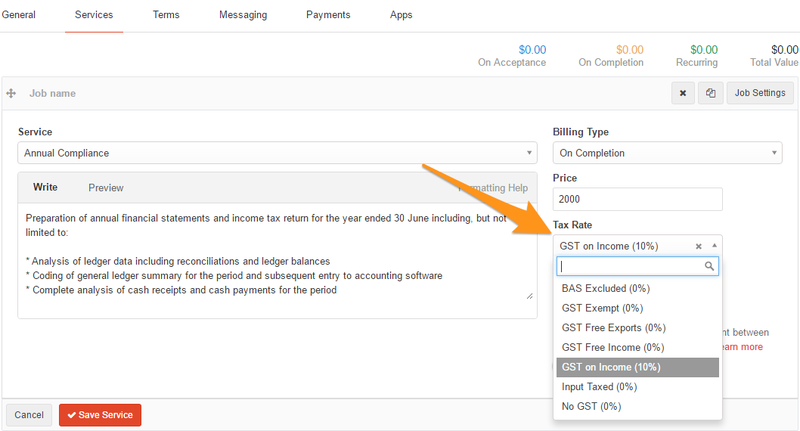 When you select a service while building a proposal, the default tax rate will be selected. This is either the service override rate or the company default rate will be used as a fallback. This is the tax rate that will be used during tax calculations for proposal amounts and for invoices.